The SIQEV seals guarantee the consumer that any container or bottle with this label is Extra Virgin Olive Oil of the highest quality. QvExtra! is an international non-profit organization created by olive oil growers and producers that were addressing the growing demand for high quality olive oil. As an added value, QvExtra! 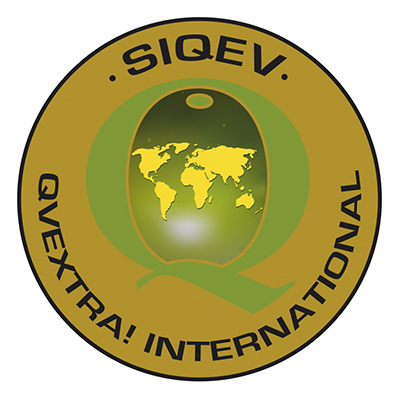 attempts to collaborate with other international associations to defend and promote authentic extra virgin olive oil in order to standardize the SIQEV seal. It is recognized and valued internationally as a standard-bearer of indisputable quality for producers and consumers alike from various countries, based on shared codes and quality control standards. One of the main objectives of QvExtra! Is to inform the consumer about all the various cultural aspects and traditions associated to the olive sector, such as its extraordinary physical characteristics and the nutritional, therapeutic and sensorial traits of extra virgin olive oil. Another objective is to bring the consumer closer to the various aspects of olive oil: where and how it is produced in each area and the characteristics and recommended uses for each variety. The Oleoestepa cooperative is one of the founding members of QvExtra! The brands Estepa Virgen, Egregio and Oleoestepa are all certified.